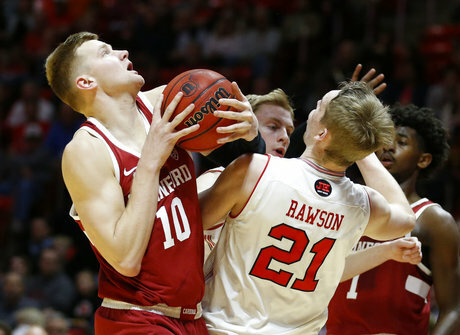 SALT LAKE CITY (AP) — Larry Krystkowiak didn’t want his team to worry about offense on Thursday night, so, naturally, Utah went out and had its most efficient offensive night of the Pac-12 season. Justin Bibbins scored 18 and Utah led wire-to-wire in a 75-60 victory over Stanford. The Utes (14-9, 6-6 Pac-12) broke a two-game skid while the Cardinal (13-12, 7-5) watched a two-game win streak end. Bibbins finished 7 for 9 from the field, including 4 for 4 from behind the arc, as Utah shot 50.0 percent from the field — a season high in conference play. Sedrick Barefield added 17 points and David Collette chipped in 13. Reid Travis scored a Stanford-high 16 points and had 10 rebounds while Daejon Davis posted 14 points. Utah went into halftime with a 40-28 lead powered by a 14-2 run that put the Utes up 36-22. Bibbins and Collette combined for 20 first-half points while shooting 8 for 9 from the field. The Utes’ 55.2 shooting percentage was a season high for the first 20 minutes during Pac-12 play. A 14-0 second-half run punctuated by a Bibbins triple gave the Utes a 67-44 lead and put the game away. The Cardinal entered the night as the second-best shooting team in Pac-12 play (49.3 percent), but the Utes held them to just 30.8 percent from the field in the first half. The normally efficient shooting was off all night and Stanford finished at 35.8 percent. “This isn’t going to be the first or last team that’s going to zone us like that,” Travis said. “We’ve got a lot of talented players that can do a lot of things one on one, so it makes sense why teams want to zone and take that away. 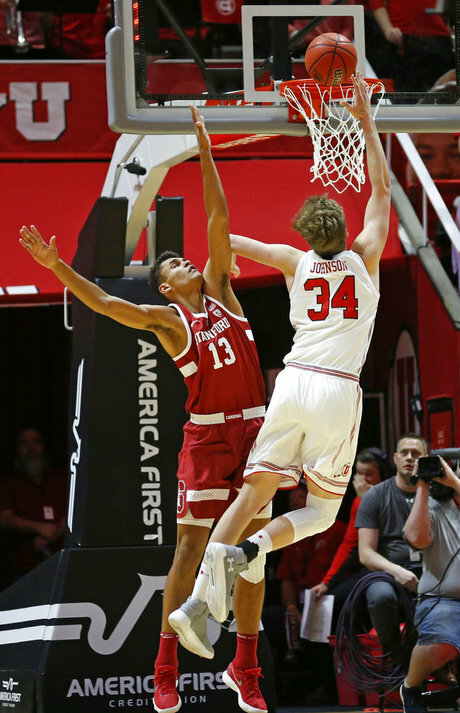 Stanford: The Cardinal entered the night tied with UCLA for the No. 4 spot in the Pac-12 standings and lost ground in the race for a first-round bye in the conference tournament. The night began with eight teams having between three and six conference losses and Stanford still has to play Arizona, Washington and Arizona State. Utah: The Utes are confident they can move up into a top-four seed and a first-round bye in the tournament. Thursday was big step in that direction, gaining a full game on the Cardinal. Utah has four games remaining against teams in front of them in the standings that are also fighting for that bye. Stanford: Travels to face Colorado on Sunday. Utah: Hosts California on Saturday.